(Salvia officinales) This organically grown common green garden sage plant comes in a reusable bamboo pot. Attractive evergreen, grey/green shrubby plant with beautiful mauve flowers. Likes full sun and prefers for its soil to be dry instead of moist. 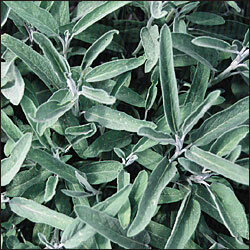 Sage is the herb we think of with turkey, chicken and also in our turkey dressing at Thanksgiving. Great for chicken soup too.